Library Highlights: Welcome new lawyers! This month new attorneys are being admitted to the Wisconsin State Bar. Welcome new lawyers! 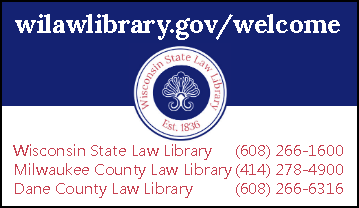 We can help you check out library materials, log in to legal research databases, and help you with other legal research questions. Check out library books and videos at our 3 libraries in Madison & Milwaukee or by mail. Delivery by mail is available to residents outside of Dane and Milwaukee counties. Renew books at wilawlibrary.gov/renew or call 608-266-1600. Items can be renewed once. Return at any of our 3 libraries in Madison & Milwaukee or by mail. Get cases & forms emailed to you, KeyCite & Shepard's reports, and copies from library-use-only items. Ask us for help borrowing items from other libraries. Visit the library on your schedule with our After Hours subscription access. Sign up to use the library before we open, after we close, and on weekends and holidays. Read our newsletter and blog on our website and follow us on online for community and timely updates on Facebook, Google+, and LinkedIn.